1973 Mustang Convertible. Can someone help me identify what's missing in this pic? It looks like there should be something between the bracket with the hole on the left that would attach to the shaft with the boot on the right. Thanks in advance for the help. The lock-out rod from the transmission connects to it. I see this is your first post. Please go to the introduction section of the forum and introduce yourself and your car. We like pictures. The arm coming off of the steering column is where the backdrive rod attaches- this rod is the link between the shift linkage (specifically the reverse shift arm on the trans) on the transmission and the collar on the steering column that rotates ccw when you put the shifter in reverse and lets you get the key out of the ignition. The bent link coming through the floor is the link between the clutch pedal and the clutch equalizer or Z-bar, which is missing. (04-01-2019, 11:08 AM)Don C Wrote: The lock-out rod from the transmission connects to it. Thanks for the quick reply, assuming this is for a manual trans as shown below. Mine is a C4 auto and 302. Rod used for locking the 4 speed manual transmission in "Reverse". Connects to the lower tab of the steering column and the reverse control transmission lever shift arm. Prevents the transmission from shifting out of reverse when the ignition key is removed. Rod is about 13 inches long and was originally marked with a green paint mark. The 4 speed manual transmission, could not be ordered on the 351-2V engines. Only 351-4V's and 429CJ's in 1971, and 351CJ's (Q code) in both 1972 and 1973. Transmission code "5" or 6"" on your door data tag. 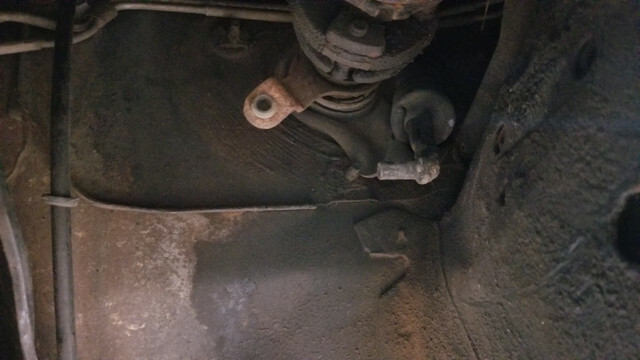 (04-01-2019, 11:11 AM)mjlan Wrote: The arm coming off of the steering column is where the backdrive rod attaches- this rod is the link between the shift linkage (specifically the reverse shift arm on the trans) on the transmission and the collar on the steering column that rotates ccw when you put the shifter in reverse and lets you get the key out of the ignition. Thanks. I was told this car was an auto originally. Can I verify by VIN or other numbers? Automatics also have the lock-out, transmission has to be in park to turn the key to the off position and remove it. Am I doing something wrong? Cant find the trans code "W" in VIN using the link below. My comments about the trans were based on the end of the clutch pedal rod being visible and what looks like witness marks around the mounting holes for the frame side Z-bar mount on the frame rail in your pic.